Team Ketubah is proud to offer every couple we work with… accessories for your Ketubah, if you’re an Apple fan, like we are! Starting today, we’ll offer every couple in our family (since we consider y’all to be in our family!) the additional option of getting a Mac cover that is an image of their Ketubah! They look wonderful. 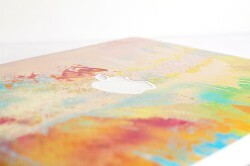 Now, your Mac cover can not only be unique — literally, it is your Ketubah art and text there! — but you can show it off every time you flip the Mac cover up! We will soon be posting pictures, or just ask us if you haven’t seen a photo yet! And no, we’re not fanboys, what would ever give you that idea? C’mon! We’re so excited–are any of you as excited as we are? To Kuf Or Not To Kuf? One of the decisions that you need to make for your ketubah is, whether or not you want to fill in the leg of the kuf. Huh? What does this mean? Let me explain in today’s lesson, Kuf 101! One word that the traditional ketubah includes is v’kanina (?????? ), which in ancient Aramaic means, “we have completed the act of acquisition.” This word includes the Hebrew (and Aramaic) letter kuf (?). (Yes, this is weird—but bear with us!). Traditionally, this letter in this word in the ketubah was created with only the top part of the kuf (see the image above, on the right), and then the rabbi filled in the leg (see image above) himself at the wedding. The origin of this tradition is a symbol that represents the act of a man acquiring a woman at that very moment, so the rabbi himself completes this acquisition, by filling in the leg of the kuf. Continuing the ancient tradition; and printing the ketubah without the leg, so that the rabbi himself can write it in at the moment he presides over the ketubah ceremony. Simplifying the tradition and not printing the kuf, having the rabbi write the whole letter himself (top and the leg of the letter). Changing the text to not use the word v’kanina at all—because, after all, many modern couples don’t want the wedding to be the man “acquiring” the woman! Therefore, one of the key symbolic decisions that each couple needs to make is, to kuf or not to kuf. This question, although seemingly superficial, does have some Shakespearian overtones, because of the symbolism it represents: what is your view towards the husband acquiring the wife? Here at Ketubah HQ, we happen to be divided on the question. Two of us are married—and one of us used the text with the leg, and one used the text without. And most of our friends used texts with different wording – so we see it from all sides! If you do want us to not include the leg—then don’t worry, we can do that! When we give you our personalization form, we’ll include this question on the form, and you can fill it out there! 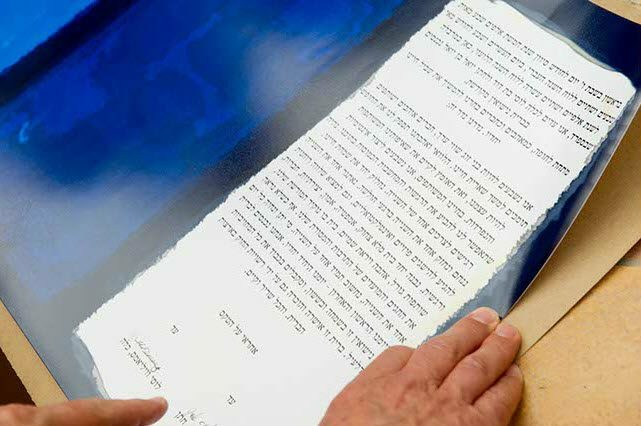 It is important to decide this text detail before your ketubah is printed to avoid going back and reprinting, and ultimately a time delay on your ketubah. Either way the decision is completely up to you! We love making design tweaks onto a Ketubah for our couples — this is a great way to make a ketubah unique for you two. 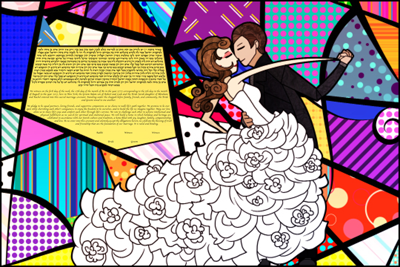 Notice the dress to match the wedding dress matches the bride’s, and the couple looks more like them. A close up of this image is here. Want a Tweak to make your dream Ketubah perfect? Just ask! Why Do Ketubah Artists Charge for Personalization? Isn’t It Just Writing In a Few Words? Oh boy, so much to say on that topic! Where to begin!! 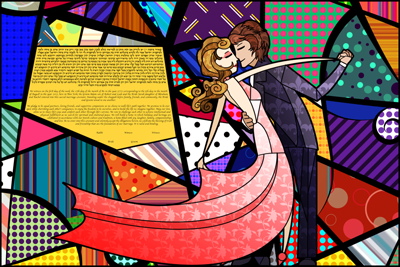 When we started This is Not a Ketubah, we thought the exact same thing! So, at first, our prices included the personalization. “Every other ketubah artist rips off their clients” — we thought — “by charging $75 to $125 for just a few minutes worth of filling in the blanks of the text! We’re not going to do that, the most important thing is that we treat every single couple the way we would want to be treated, deeply fairly.” So we included that in the price. It’s just a few minutes, right? Then, three things happened. Something small, and then two big things. First, the small thing. Every started telling us, “Why are your ketubot so much more expensive than everyone else’s?”. Our response, “No, they’re actually substantially cheaper — but we include everything, rather than add in every little cost like personalization!”. Couples thought and said this so much, that we decided to separate out the personalization and suddenly, everyone started telling us, “Oh! Your Ketubot are so affordable compared to everyone else’s!”. Funny how that works; human nature is such so that, people seem to judge prices by the big price in big numbers, not the true final price. (Which is unfortunate, since I hate the phone company style adding lots of hidden charges–I hate that–which is why we insist on being very clear about all charges and why we include shipping and taxes!) But this is the small thing. Secondly, the first big thing that happened is: we strongly urge each client to have their rabbi or officiant review and approve the Ketubah before we print it. And working with lots of rabbis and we discovered, first of all, that rabbis are very, very hard to pin down. Rabbis are so busy, doing so much hard and awesome work, that is more urgent than this — that it’s hard to get them to stop and review the proofs! (I don’t blame them, with whole congregations to manage!). It often takes hours and hours, and phone calls and get a rabbi to review the proof, and make sure he approves it. Suddenly, the five minutes of filling-in-text has turned into hours of phone tag. Third, the other major realization, was that, after working with so many rabbis, we found that every rabbi has his/her own conventions. Some rabbis say, “write the year as ‘two-thousand and twelve'” while some say, “write the year as, ‘2012.’” Some rabbis say, “in every mention of Moishe’s name, write it as ‘Moishe ben Mordechai'” while other rabbis say, “Use the ‘ben Mordechai’ only in the first mention of Moishe’s name and then again in the Lieberman clause, but not in-between.” And so forth. 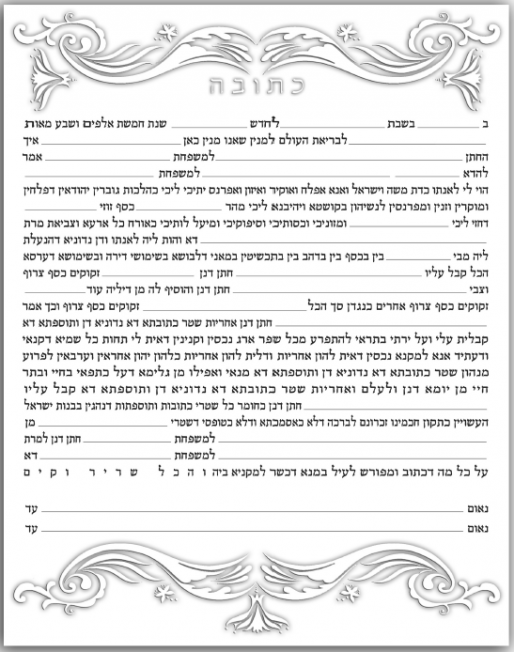 So, it is rarely the case that the rabbi reviews it and gives us the green light; more commonly, the rabbi asks us to change the Ketubah so that it complies with his preferred conventions. Of course we happily make all changes — our goal is to keep you and the rabbi happy, and give you the perfect ketubah, and your rabbi loving the final version is essential! But all of this back-and-forth to clarify all of the conventions takes time. Suddenly, what seemed like a quick-and-easy cut-and-paste job turns into lots of hours of back and forth phone conversations, trying to perfect the wording. And that takes non-trivial time. And so, ladies and gentlemen, these reasons, taken together, are why we changed our structure to charge for personalization separately. Any questions? Just drop me an email and ask! Decide if you want to include the Hebrew text or not. One question we’ve seen many interfaith couples debate among themselves is, how much do you want to emphasize the Jewishness of the Ketubah? It’s a complex question because a Ketubah, by its very nature, is already deeply Jewish! We’ve seen many couples opt for both the Hebrew and English (Interfaith) texts; but often, they want only the English Interfaith text as well. If there is an officiant but no rabbi, then, do you want the officiant to review the Ketubah text? 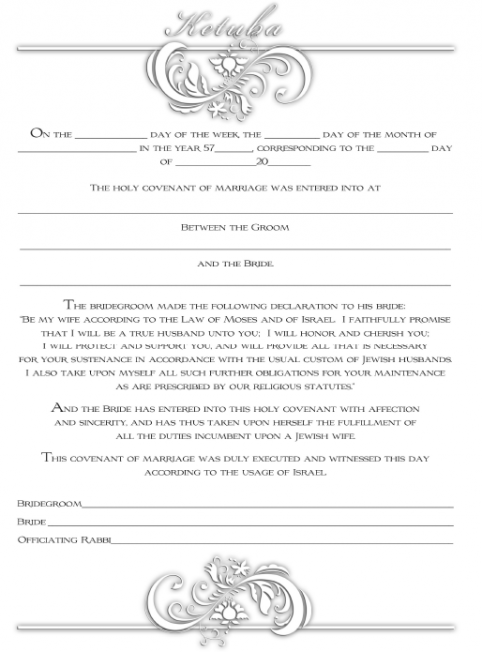 Some officiants care deeply about the text of the Ketubah contract; others view it as a quaint traditional and formality. There is space for either tradition–but your Ketubah Team needs to know whether to review the ketubah text with your interfaith officiant! Usually, the non-Jewish spouse’s parents won’t have Hebrew names. 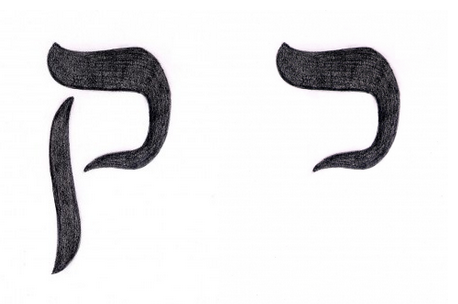 This can create some confusion if we use the Hebrew text for the Ketubah: should we transliterate the names into Hebrew? Or should we remove the mention of the parents altogether? We can do both; most couples vote for the transliteration. Do you want to incorporate themes from the non-Jewish partner’s tradition? There are many ways to incorporate themes from both religions or traditions into the Ketubah: a Celtic ketubah with Celtic symbols; or a trilingual Ketubah with three texts is another. Rush Ketubah? Team Ketubah Is Here to Help! Is your wedding coming up in less than 3 weeks, and you don’t have a Ketubah? If your wedding isn’t tomorrow, we can help!! We’ve worked with lots of last-minute couples. We use FedEx Next Day Air with Tracking, so no need to worry! Our dedicated Arts Team will create a Ketubah you’ll absolutely love, as quickly as you need it! First, pick you design, just look through our Gallery! I want to see pictures, please! All about shipping: US Ground Shipping in the US is free (7-10 Business days). Canada is $30 regular ground. For Rush orders, which is 21 days or less of the Expected Delivery Date, you will have to choose 2 day or overnight shipping. How much will I spend? Most couples spend about $400 on their Ketubah. 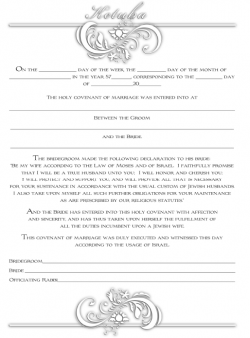 The Official Guide: Receiving & Signing your Ketubah! Congratulations! Team Ketubah has sent your Ketubah to print, and you’ve received the FedEx or UPS tracking number. Hurray! Note:If you don’t receive your Ketubah or the FedEx delivery status is inaccurate, email or call Team Ketubah right away! As soon as you receive your Ketubah, open up the mailer! Inside you’ll find your Ketubah, and maybe some surprises too. Depending on your print medium, your Ketubah may arrive in a tough Cardboard Tube, or shipped flat in a sturdy rectangular box, guarded by additional layers of Cardboard inside the box. For Ketubot Shipped Flat, carefully open the package by opening the box from one end. DO NOT cut into the box — you could damage your print! As you remove the support board which carries the Ketubah, carefully remove the light adhesive tape. Inspect your print to make sure its absolutely perfect, and check the mailer for any other little surprises! After you and your fiance have admired your print, return it to the print to the box in a cool, dry place. It’s the safest place until wedding day! For Rolled Ketubot Shipped in Tubes, begin opening the mailer at the end closest to the shipping label, and remove all tape or packaging from that end. DO NOT cut into the tube — you could damage your print! As you remove the print from the Tube, gently drag it vertically along the tube wall. Stay calm, and be careful not to force the print with your fingers! Once you’ve removed the print, it may have a slight curl, this is totally normal! We recommend placing the print on a flat surface, and leave it for 24 hours. If after this time the print still does not lay flat, you can weight down your print with books or other non-sharp weights, by first place a layer of wax-paper between the print and the weights. One flattened, we recommend maintaining the print flat until Wedding Day! Team Ketubah recommends transporting your Ketubah to the wedding site in the same mailer package it arrived in. If you have recently flattened a rolled Ketubah, carefully re-roll the Ketubah and place it in the mailer. If it is only rolled for transportation and is immediately taken out and laid flat again at the wedding site, it should stay flat! Yay! The moment is here! By signing your Ketubah, you’ll be joining generations of Jewish couples, and even having a little fun! Here are some tips for every print type, and we recommend extra care for Endura Prints! Choose one of the Pens for Signing Your Ketubah page, and chose the option that is best for your style and taste. Have the signing pen and a spare sheet of paper available, to test the pen and practice signatures, if signers are feeling excited. Place your Ketubah in a central location. We don’t recommend passing the Ketubah around the room! Give ample drying time for the signatures, on all print mediums for all pens. Humidity, lighting and temperature can all affect drying time — don’t risk touching the print too soon! Congrats on successfully signing your Ketubah! We can’t wait to see pictures!! Conservative with Lieberman Clause Text Option! 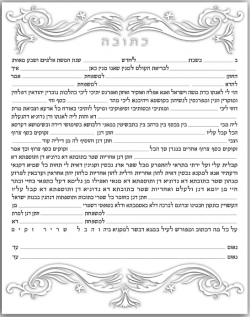 If you belong to a Conservative temple, synagogue, or congregation or your Rabbi will probably ask you to find a Ketubah with a Conservative Text, with Lieberman Clause! Team Ketubah’s Conservative text is the same endorsed by the Rabbincal Assembly, the international association of Conservative rabbis. 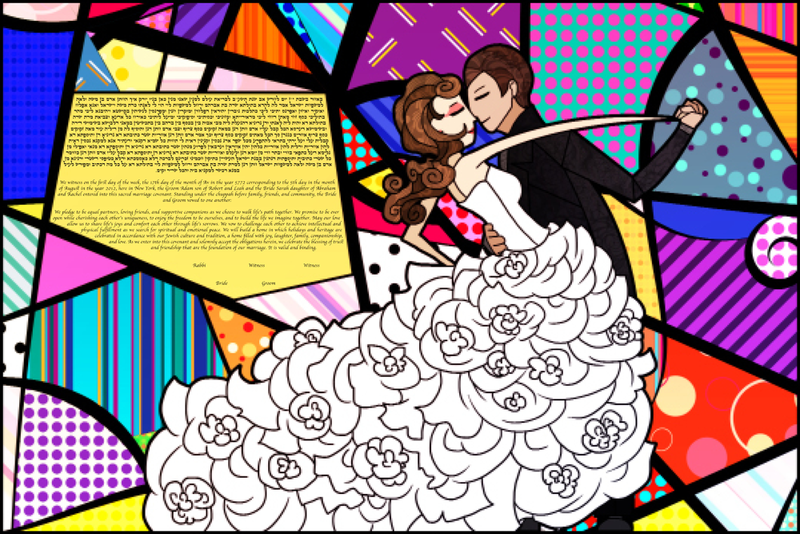 You can see the Conservative Ketubah Text Info Here, or download the PDF. Team Ketubah uses this exact text, and we’d be happy to edit it, to your Rabbi’s request! We’re more than happy to Mix-and-Match the text with any English option you prefer. Of course, we always send you a Pre-Print Proof and will never print without the Green Light from you, and your Rabbi!. So, no need to worry! See the rest of our text options here. If you have more questions, give Team Ketubah a call! 347-627-0022 or email us at < team@TINAK.org >. Looking for the most traditional text option for your Ketubah? One that has been used for hundreds (since the Talmudic era!) of years by the Jewish people? Did your Rabbi tell you to get “any Orthodox text” but not sure what he meant? Read on! For our most religious text option, Team Ketubah uses The Traditional Orthodox Aramaic Text as published by the Rabbinic Council of America. The RAC is an organization of over 1,000 Orthodox rabbis from across the world, which services the Orthodox rabbinate and partners with various Jewish organizations to promote the welfare, interest professionalism among Orthodox rabbis. Team Ketubah uses the exact exact text offered by the RCA on their website, the standard among North American Orthodox and Modern Orthodox Rabbis. You can download the official RAC Aramaic Text PDF by clicking here. The RAC also has a recommend English, and we’re glad to use that as well! Choose these options on your Order Form and we’ll get started on your proof in no time! Share this text with your Rabbi to double-check that everything is Kosher! If your Rabbi or officiant would prefer a different text, be in touch < team@tinak.org >, and we’d love to help! Or, you can check out our additional Ketubah Text Options!